We offer quality high performance Power One and Signia Siemens German made standard disposable hearing aid batteries and Power One Accu Plus rechargeable hearing aid batteries. Power One Accu Plus rechargeable hearing aid batteries are the same batteries that Signia Siemens offers with their new eChargers. We offer these batteries at discounted prices. We do not offer low-quality hearing aid batteries at cheap prices. 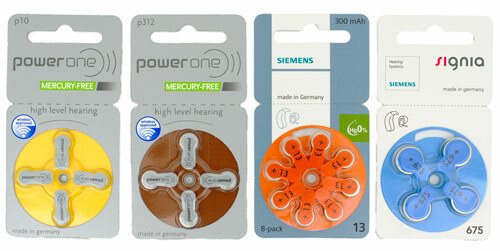 There is a considerable difference in performance and reliability of the Power One hearing aid batteries. We only offer high quality hearing aid batteries because we do not want the quality and performance of hearing aid batteries to affect our patients hearing aid performance. We offer only quality rechargeable batteries, The Power One Accu Plus rechargeable hearing aid batteries manufactured by Varta in Germany and they are backed by a one-year warranty. These are the same Signia Siemens rechargeable hearing aid batteries that are provided with the eCharger and Rexton Connexx Smart Power Charger. The Signia Siemens Rechargeable batteries and Rexton Rechargeable batteries are available in two sizes; 312 and size 13. The batteries have a life of approximately one year or 420 recharges. These batteries are nickel metal hydride and are designed to be recharged every evening. Please note: Standard disposable non-rechargeable batteries cannot be used in a Signia Siemens eCharger or in a Rexton Connexx Smart Power Charger. Using standard disposable non-rechargeable batteries, instead of rechargeable batteries may cause damage to the charger and the hearing aids. Our batteries are made by Varta the maker of Power One brand. They are a high-quality German manufacturer and are also packaged and branded by Signia Siemens. The batteries are Mercury free and available in size 10 (Yellow), 312 (Brown), 13 (Orange), and 675 (Blue). We chose Varta Power One batteries because they received the best feedback from our patients, compared with any other brand that we have offered. Standard hearing aid batteries are discarded after use and are not rechargeable. If these standard disposable non-rechargeable hearing aid batteries are placed in a hearing aid battery charger they can cause damage to the charger and the hearing aids. If you would like batteries shipped to you we generally ship USPS or UPS ground. Shipping costs generally range between $5.00 and $10.00 based on the quantity of batteries and the shipping requirements.